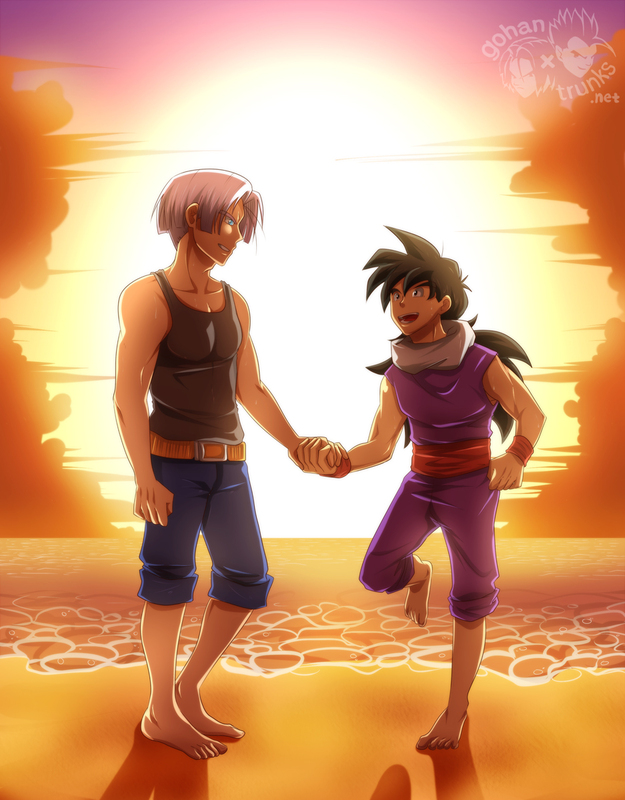 This is the story of the alternate future where Trunks and Gohan live but in a completely different way. In this story, Trunks does not grow up with his mother or father, is orphaned and in charge of Gohan, the last Z senshi standing to defeat the androids after they killed his friends and his sensei Piccolo. Together they must face adversity in a world full of pain and death, at the same time, a small spark of romance will emerge between them. Characters do not belong to me, but to Toriyama-san but the short fic is from MY property. Chibi Gohan ran as fast as he could in the forest to went back home, not long ago he was training in the depths of the forest when he felt that his father's ki was getting weaker and weaker, he get worried because he knew that he was gravely ill from a heart virus he had contracted during his journey through space. The virus was of dubious origin and unfortunately, there was still no cure for it, the half-saiyan arrived at a pond and jumped making a slight sound when his feet touch the water, when he finished crossing, he kept running towards his house. Meanwhile, outside the Son house, all the Z senshi were there, Vegeta stayed away as usual, sitting on a rock in the lake in front of the house on mountain Paozu, none of them spoke, all kept a deep silence, the only thing that could be heard in that silent atmosphere was Trunks cries, who was conforted by his mother, Bulma, she kept a serious expression, she had already foreseen that something like this could happen but not with her best friend, not with him. Finally, Gohan arrived at his house calling the attention of all those present, who did not hesitate to give him permission to come inside, as soon as he did he went to his parents' bedroom but by the time he opened the door and entered on it, his father ki had disappeared completely. Chi-chi looked away to find her son standing in the door of her bedroom, she got up and approached to him with sadness reflected in her eyes. "You're late, Gohan" the dark haired woman said, her voice cracking as her hands clung tightly a cloth handkerchief "G- Gokū... your father is dead, I'm so sorry." The younger half-saiyan watched in fear how his father rested in that bed with his eyes closed, as if he were sleeping, although everyone knew perfectly well that he was not sleeping. He moved slowly with trembling steps as he felt tears build up in his eyes, it was not true, what his mother was telling him was not true, his father... he... he could not be dead, he knew him well, he was one of the strongest warriors of the universe, and as Vegeta said, he could not die for something as simple as a heart disease. “How I would like to say that it isn’t true, but in fact what we feared most happened. Gokū is dead” Chi-chi answered who burst into tears and hugged her father for comfort. The Z senshi, who were outside the house, were surprised as they stopped feeling their friend's ki and they could not believe that the wild haired saiyan had died, even Vegeta was surprised and furious at the same time, now he would never finish paying his debts with his friend and worse rival, baby Trunks was crying inconsolably in his mother's arms when he felt the pain of all the people who were there. Gohan also cried as he clung tightly to the bed sheets and hid his face in them; even Master Roshi who was there accompanying Chi-chi and Ox Satan took off his sunglasses to wipe the tears from his eyes. "Daddy..." Gohan whispered as he raised his eyes and wiped his tears with the back of his hand "this will not stay that way, I promise I'll do my best to protect the earth like you did, I'm not going to fail you." Six months passed since Gokū's death and after that tragic day, the Z senshi did not train during that period of time thinking that no one was going to attack the earth, but they were wrong. After that tragic death, the androids appeared, they began to kill people and destroy cities just for fun. At first, they were created for the purpose of killing Gokū because he had attacked the Red Ribbon Army when he was barely a kid, but now that the wild haired saiyan died, they had no reason to kill him. The Z senshi did everything possible to stop them, but unfortunately, due to lack of training, one after another died in battle, even Vegeta turned into super saiyan could not defeat them and ended up being killed by android #17, which brought pain in Bulma's heart, who had just believed that she had managed to change the saiyan prince a bit. The only warriors left standing to defeat the androids were Gohan, Piccolo and Krillin but the last one could not stop the androids and it did not take long for him to also go with his friends to the other world, so only Piccolo and Gohan remained to protect the earth. Apprentice and sensei fought against them with all the power they had, still, fighting the androids was in vain, every time they hit him, the androids dodged easily and returned the attacks hurting them seriously, after a while fighting against those infernal machines, both warriors were seriously injured and keep standing, while #17 and #18 remained intact, they had no damage or injury, gathering forces that who knows kamisama from where he took them, Gohan ran willing to attack the androids again but an arm stopped his path. "P-Piccolo-san?" the half-saiyan said with one eye closed because of the pain he was feeling but it was bearable. “Get out of here, Gohan! I will fight alone against them! "Piccolo replied. “No! I'm not going to leave while I let those monsters kill you" Gohan exclaimed annoyed "we're in this together and we're going to defeat them." "Gohan, don’t make me say it again, get out of here before it's too late" the namek exclaimed, but Gohan did not think to leave, not as he watched how his sensei was beaten and attacked variously without mercy by those androids, the younger half-saiyan just watched as Piccolo was starting to get tired and the androids were still unharmed. Finally, Gohan got tired of just standing there watching without doing anything, he clenched his fists hard enough to make them bleed and he quickly launched himself to attack the androids, ignoring his sensei's warning to stay out of the battle. The half-saiyan flew towards #18 but barely felt the blonde girl's gaze on him, Gohan jumped on her, he positioned himself behind her back and started throwing ki blasts and punches without control but #18 still not receive any damage, the android rolled her eyes, signaling that she was getting bored of the pathetic attacks the kid was giving to her. With just a single kick, #18 pushed Gohan away from her causing it to crash into a building, the dark haired half-saiyan tried to get out of there but when he tried to do it some debris fell on him leaving him unconscious. When he woke up, Gohan slowly removed the debris from his body, he slowly walked out of the building and began to look for Piccolo but he could not find him anywhere, he could not even feel his ki, tears appeared in his eyes at the mere idea to know that his sensei had died, he closed his eyes and clenched his fists hard for the anger he was feeling at that moment, he opened his eyes breathing rapidly, he walked a few steps and could see that the androids had destroyed several buildings almost leaving them in ruins. Without wasting more time, he flew following the road of destruction with the intention of finding the androids to take revenge on them but he only found more and more chaos wherever he saw and he could not feel the androids energy, he supposed that they had gone to another place, that did not matter now, he would take revenge on another occasion. Suddenly, he stopped when he saw that the way of destruction was leading him to a known way... Capsule Corporation! “Oh no, this is bad... probably those androids attacked Bulma or Trunks” Gohan thought, he increased the speed of his flight and went to Capsule Corporation. He landed in front of the half-destroyed building main door, he opened the door and entered seeing that the place was full of rubble and the metal beams that supported the building half circular roof were falling against the floor breaking the ceramics, he walked through the corridors looking for Bulma, calling her by her name and even trying to perceive her ki but the debris made it difficult to search and caused a fluctuation in ki, until he heard a scream coming from one of Capsule Corporation rooms. “Gohan, don’t worry, I'll be fine. It's nothing serious" the light blue haired scientist said, coughing slightly "the one who worries me the most is Trunks." “Trunks? what happened with him? where is he?" Gohan asked, worried about the little baby. "He's resting in his crib in my bedroom" Bulma replied “go for him and take him away from here, I don’t want the androids to find him." "I'm not leaving, not knowing you're injured, Bulma-san" Gohan replied, he was not going to abandone his father's best friend, that woman he always admired and appreciated as if she were a sister to him. “Okay, I'll go find Trunks and then I'll come back for you” Gohan said, he was going to leave but Bulma stopped him squeezing his hand with the few strengths she had left. Gohan breathed deeply feeling the tears come out of his eyes again, he calmed down, he nodded, left the laboratory and ran to the Bulma’s bedroom, as he walked, the building began to fill with more and more smoke which make him coughing and preventing him from seeing the road, he leaned against the corridor walls, taking care not to step on the rubble and the metal beams that fell from the ceiling until he heard a cry coming from Bulma's bedroom. Quickly, the dark haired half-saiyan approached to the light blue haired scientist's bedroom. He could not open the door with the security code, so he had to use his strength to tear it out and throw it away, the bedroom was in flames which brushed against the crib where the baby Trunks rested. He avoided the flames and approached the crib where he could see a small baby crying lying on the soft mat of the crib, Gohan looked towards the bedroom entrance to make sure that the androids had not entered on Capsule Corporation, as he could he covered the baby with a light yellow blanket, he carried it in his arms and ran out of the bedroom to the exit while trying to calm down Trunks, who did not stop crying. “Shhh... don’t cry, Trunks. Please don’t cry" Gohan whispered as he rocked the baby in his arms. He stopped abruptly when he saw two shadows standing in front of him... damn it! The androids had come there, they had found them.